So since the game actually made it onto Gawker — and not just the Gawker family’s game blog, Kotaku — I suppose I should write something about Epic Mickey, a slightly twisted Disney video game that has me more excited about the round-eared one than I’ve been since I was a kid. Disney has a long history with video games, going back to a 1981 Game & Watch title, Mickey Mouse. My earliest Disney game memory — and likely that of many people who will read this blog — is 1987 NES title, Mickey Mouscapade, which had Mickey and his ladyfriend hopping Mario-style through various levels, shooting stars (for some reason), fighting villains like the evil queen from Snow White (for some reason) and finally rescuing Alice from Alice in Wonderland (for some reason). 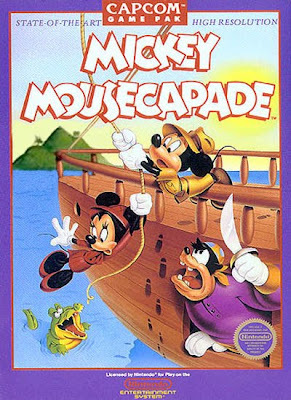 Mickey Mouscapade was great fun at the time, but, in retrospect, the game kind of sucked, even for a first-generation NES title. Easily the worst part was the play control; Minnie follows Mickey around, jumping slightly after he jumps and landing slightly behind where he lands. This resulted in Mickey successfully leaping over those bottomless pits that so often dot the landscape of platformer-style video games but Minnie falling in and plummeting to her death, causing Mickey as well to die (again, for some reason.) Regardless, Mickey definitely has a place in my fond memories of playing video games. Epic Mickey looks different. Rather than stick Mickey and his Disney cohorts in a bright, shining universe with smiles on every rock, tree and cloud — you know, like where Mario has been living for the last twenty years — the game’s designers have tried to grow Mickey up a bit. Mickey’s new world is a little dark, a little steampunky. Take, for instance, this nightmarish half-robot version of Donald Duck. Not exactly the same waterfowl that hugs the kiddies at Disneyland, is it? Gaze also at this trippy concept art. 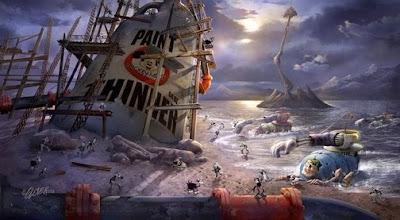 If the in-game graphics of Epic Mickey come close to matching what’s above, then we’ll be in for a treat. What has me most excited about this game, however, is the news that its big bad will be Oswald the Lucky Rabbit, a character Walt Disney and Ub Iwerks debuted in 1927, a year before the suspiciously similar-looking Mickey Mouse stole the spotlight. Money disputes prompted Disney and Iwerks to eventually leave Universal Studios, which maintained ownership of Oswald until 2006. Wikipedia explains that as part of a deal between Disney and NBC Universal, the former traded the latter sportscaster Al Michaels for Oswald. Michaels now workings alongside John Madden at NBC, and Disney finally got the rights to a bunch of old Oswald the Lucky Rabbit cartoon shorts. (I have to wonder how Michaels must feel about this trade. “You, sir, are basically worth the same as an obscure cartoon character that few remember and who looks basically like our current mascot.” Wikipedia notes that Michaels at least publicly had the sense to make a joke about the trade: “Oswald is definitely worth more than a fourth-round draft choice. I’m going to be a trivia answer someday.”) In any case, Oswald is back — and presumably pissed for having been shoved aside for some many years while Mickey lived the good life, being all recognizable even to people who don’t own TVs or have access to movie theaters. This sort of thing thrills me: a fictional universe with a long history pulling an obscure also-ran from its archives and giving him or her a chance to shine once again. It doesn’t happen often enough, though I suppose superhero comics do it pretty well. Who would have expected Batman’s Jason “Robin No. Two” Todd to be resurrected from the dead? To draw an example from a different form of pop culture, the new Melrose Place wins points for me — even though I haven’t watched it — for bringing back Laura Leighton’s character from the original series, Sydney Andrews, even though she too was once dead as a doornail. It’s fan service, I guess, but it’s something that really clicks with the geeks who know a given universe inside and out. (“They thought of that! That’s what I think of! I feel validated!”) It’s good to know that the people in charge of a given franchise know at least enough about it to appease the experts. I don’t know how well the game Epic Mickey will be received, but it gets points from me for rescuing Oswald the Lucky Rabbit from obscurity. And I look forward to beating the crap out of him at the end of the game. A closing thought: Mickey Mousecapade’s control issues notwithstanding, I do think that the -capade suffix needs to be used more often. And I can't wait for Epic Mickey either. I have to have trust in a project this ambitious when it's helmed by Warren Spector. I'm glad that we get to see a return to the more mischievous, "Plane Crazy"-era Mickey. Over the past few decades we've seen Mickey lose his identity to the point where his only personality traits seem to be "whatever we think of when we think of a cartoon 'good guy'". 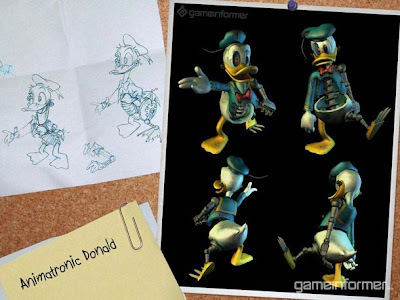 Re:Oswald, in the cartoons he's been known to carry a shotgun, so do you think that'll make its way into the game? I've never played Mickey Mousecapade, but I remember my wife telling me about how annoying it was that Minnie was always following you. 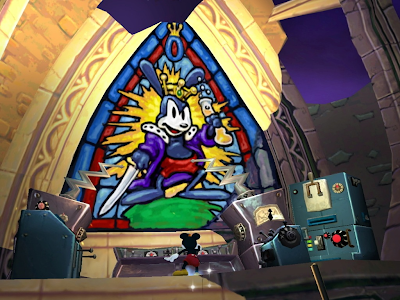 As for Epic Mickey, I wonder if any more obscure characters will make appearances.